Action Logs are something I'm sure we've all added to the bottom of a Domino web form. Here's an example of one I added to a recent Domino-based app I created and then wrapped with Bootstrap. The log is shown to the user as a three column table(when, who, what) with the latest action first. This field is built up by recurring calls to a LotusScript method called LogAction() in the WQS agent of the document. The HTML table the user sees is generated in a Computed Value section that uses an @For() loop to create a <tr> for each entry in the log. Limit of the amount of data the backend field can store. Limit of HTML the Computed Value that displays the table on the web can store. These limitations can be worked round, but for the majority of cases the above solution will suffice. Notice the comment on the 2nd row down!? By adding comments, the chance of reaching the data limitations has greatly increased, becoming almost inevitable. To avoid the limitation I chose to add each individual comment in a field of its own. 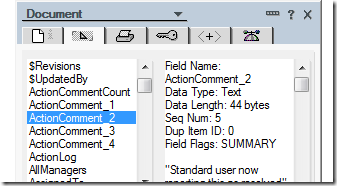 Each time an action is performed and logged with an accompanying comment a field called ActionComment_X is added, where X is the number stored in a field called ActionCommentCount incremented by 1. All that remains is to markup the comment in a <blockquote> tag and add a sprinkle of CSS to make it look like a quote. The only remaining issue is that, if people type in huge great long comments, the amount of HTML generated by the Computed Value quickly reaches its limit. Clicking on this ellipsis "button" uses Ajax to go fetch the rest of the comment. It's a solution I'm happy with and I've been sitting on for a while, thinking of sharing. Just don't know what interest there is? If there is some I can build a demo/download. That implementation is XPage-specific, but there's no reason you couldn't take the base techniques from it and apply it within a Java agent. The limits of the Computed Value would be met way, way before the limits of the number of fields allowed. For the case(s) I've used the above approach in they'll never get close to either limit (touch wood). Thanks for the MIME idea. I hadn't thought of that as an option. Should work in LotusScript too. In my application, I have need to store all changes (and also deletions) in all or selected fields, and to be able to search and find these when questions (often from a customer) arise. The only "limitless" option is to store each entry as a separate document, and pull them in using AJAX. This keeps the content documents "clean". Agreed - seems like I've had the luck way back to have customers who feel like they need looong history sections in their documents, so the relational model is one I pursued early on when embedded views became available on the Notes client. A bit trickier on the web than that but not so bad these days with all the options. A) There's no mention of Rich-text as a limitless log. This can be made to look pretty and virtually unlimited, but a PITA sometimes. B) You can 'archive' blocks of text off the list when you get to some limit, say 10k, either by deleting the last n entries or even removing element by element depending on the date. C) You can push comments/logs out to separate docs and look them up on the 'host' doc or embed a single-category lookup. Granted loads of overhead, but helps avoid limits and possibility of rep/save conflicts. Oh, and by the way, the '^^' delimiter can be a bit limiting, ok for @word, but @explode only uses a single character. If you want to avoid the possibility of a typed in char, use an 'alt-key number combination' to use a non-keyboard character.